Awaiting an upcoming pool or landscape project can be very excited. There are designs to approve and final details to settle such as paver colors or tile selections. But don’t let your excitement and anticipation cause you to overlook the potentially stressful environment that your pets will be facing during the construction process. 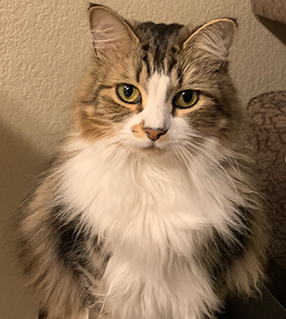 Even if your pets reside indoors most of the time, the noise and chaos of a construction project outdoors can lead to stress and unexpected behavior from your pets. Indoor cats are more likely to become stressed due to the constant noise of the construction project. But they can also become agitated when seeing strangers in the yard or outside windows or doors that they have access to. If possible, place indoor cats in a room that is furthest away from the construction area and does not have a view of the yard. Begin this transition before the project starts so that the cats are comfortable in the space and relaxed. Also try to remain on a normal schedule for feeding interacting with your cats. When the project is completed, start by leaving the door to the cats room open and allowing them to venture out as they choose to. It can take a few days for them to acclimate to having the run of the house again. Dogs can be a little more challenging during a construction project. Even smaller dogs tend to be protective of their space, including their outdoor space. They will not understand strangers in the yard, strange smells when they do get outside or the constant sound coming from the yard. In addition, the sounds of equipment can be very alarming to dogs. If loud noises such as thunder cause your dog anxiety then it might be best to see if they can visit a friend’s house at least during the day when workers are in your yard. If that is not possible then closing your dog in a room as far from the sounds as possible is a good idea. Also turning on a TV will create some white noise to calm your dog. Another important factor is maintaining as much normalcy as possible with your dog’s daily schedule. Keeping feeding time and exercise at a regular time will reassure your dog. If you normally let your dog out in the back yard to go potty, it is a good idea to begin taking him out on a leash a few days before the project begins. You will not want to allow your dog to run through or explore the construction area due to the high potential for injury. So getting him used to relieving himself while on a leash will make the transition easier for everyone. If possible, begin taking your dog for a walk to a park to relieve himself the week before the project begins so that becomes normal and he is not exposed to the dangers in your yard. If you are forced to take your dog into your yard on a leash then understand that the smells will be irresistible to him and he will want to explore even if he is on a leash. This is to be expected and can mean that once quick trips out to do his business will require more time to complete the necessary task. Be patient and know that once the project is over life will get back to normal. Also, resist the urge to let him run through the yard at night. Many items can pose an issue for your pet’s safety. Sharp tools will attract his attention because they smell like strangers. Pool chemicals could be in use, fertilizer or herbicides could also be accessible to your pet. And in the case of a new pool construction or hardscape build, open trenches could contain rebar or other objects which could seriously injure your dog. If you have older pets or very sensitive pets, boarding or visiting a friend might be the best solution for everyone. At the UNIQUE Companies we are animal lovers and many of us have fury babies of our own. We understand your concern for your pet’s wellbeing and we will make every effort to communicate our schedule so that you can make arrangements for your pet during the construction process. In the heat of a Phoenix summer, the swimming pool can be the only place comfortable outdoors. And that is probably what your dog is thinking as well. But before you decide to jump into the water with your dog, there are a few things that you need to take into consideration to ensure that your dog is safe and that he or she will enjoy this activity with you. First, just like people, not all dogs will like the water. And contrary to popular belief, not all dogs instinctively know how to swim. So just tossing a puppy or dog into the water can be a very traumatizing event that will ensure that your dog hates the water. A great deal of any dogs swimming ability will be genetic. Dogs who have been bred to swim will have long, strong limbs and some even have almost webbed paws. But dogs with short legs and short snouts are not going to be naturals in the pool. Their short legs will make swimming very difficult, and shorter noses are very tough to keep out of the water. Also, understand that even in warmer temperatures, very small dogs can get chilled easily in pool water. Pugs, Shih Tzu’s, Chihuahua, Bulldogs and Basset Hounds are some of the breeds that find water and swimming very challenging, simply because of the body type. 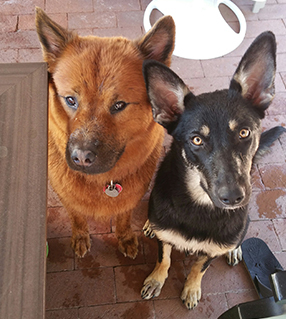 These breeds could be much happier laying in a shaded spot while you swim or hanging out in the step so that only their feet are enjoying the cool water. 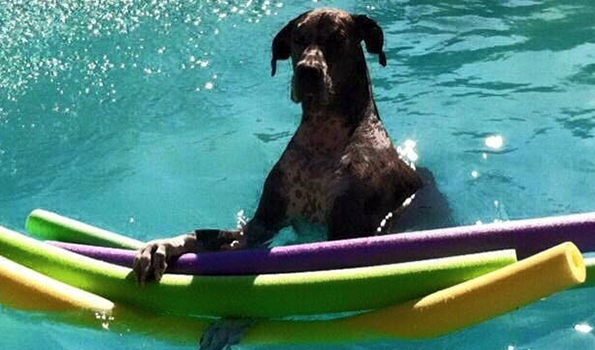 Once you have determined that your dog enjoys the pool, it is critical that you teach your dog how to exit the pool. Make sure that the dog can get out of the pool unassisted to be sure that even if you are not near, he or she can get out and not be at risk for drowning. There are many manufacturers of dog specific pool ramps that will allow almost any dog to walk safely from your pool. Some will even accommodate a goliath of 200 pounds! 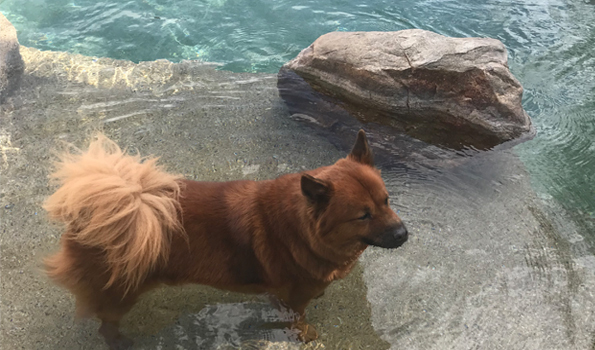 Having a dog in the pool is certain to increase the bacteria, but this can be managed by keeping up on water balance and chemistry tests on a regular basis. Ear infections are also commonly blamed on swimming pool water, but they are easily preventable. The fur around your dog’s ears will hold a great deal of moisture which can be a good place for bacteria to reside. Dry your dog’s ears as well as possible after swimming to help reduce the chance of infection just as you would with a human child. Weekly cleaning with an ear treatment recommended by your vet is also a good idea. Swimming is a great activity for your dog in the summer as long as he or she enjoys the water and is able to swim or play in the pool in a safe manner. It can provide a cooler and safer environment for exercise in the hot months and a great time for you to just hang out together.